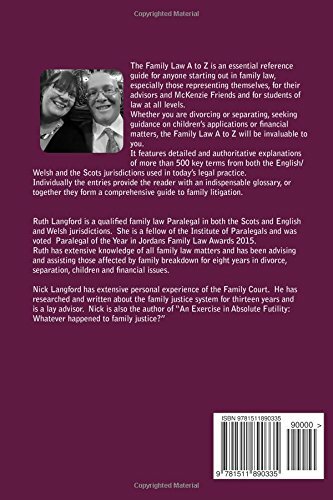 A comprehensive and detailed A to Z of family law terminology and jargon, covering both the English & Welsh and the Scots jurisdictions. 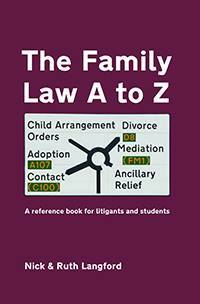 The Family Law A to Z is an essential reference guide for anyone starting out in family law, especially those representing themselves, for their advisers and McKenzie Friends and for students of law at all levels. Whether you are divorcing or separating, seeking guidance on children’s applications or financial matters, the Family Law A to Z will be invaluable to you. It features detailed and authoritative explanations of more than 500 key terms from both the English/Welsh and the Scots jurisdictions used in today’s legal practice. Individually the entries provide the reader with an indispensable glossary, or together they form a comprehensive guide to family litigation.